During job interviews, you will want to be enthusiastic, likeable, prepared, and informed. These traits are all more important than your job qualifications. Because you know this and are well prepared, you will blow away your competition! During Job Interviews Strategy #1: Arrive early. Job interviews require punctuality; arrive early. Yes, this is a "common sense" strategy that you should already know. But you'd be amazed at how many candidates show up late for their interviews! Talk about a negative first impression! Plan to arrive at least 15 minutes prior to your interview time. Use that 15 minutes to relax and mentally prepare. If something unavoidable happens and you absolutely can't make it on time, call BEFORE your scheduled time and explain your situation. Be honest, courteous, and apologetic (even if it wasn't your fault). Then ask for another time. During Job Interviews Strategy#2: Make your introduction and greeting memorable. Job interviews can involve dozens of candidates over the course of several days. You need to stand out from the pack and be remembered! So make your introduction and greeting more memorable than most. Do this with everyone you are introduced to, including the receptionist or Human Resources person who meets you prior to the interview: Smile, make eye contact, shake hands, and say their name. Make your smile genuine, and don't be afraid to show some teeth. You are very happy to be there, right? Make eye contact and notice the color of their eyes. Continue to make eye contact throughout the interview process. This is very important, because failing to make eye contact or constantly looking away creates the impression that you are hiding something or not being honest. Shake hands "properly." If you have sweaty palms (which is only natural, even if you ARE well prepared), try to unobtrusively wipe them off before shaking hands. Perhaps you could keep a handkerchief or tissue in your pocket or purse for this purpose. Then extend your hand to the person you meet, whether they've extended theirs or not. When you shake hands, match the strength of your grip to theirs. Don't forget to make eye contact. Release after a couple of shakes. Speak aloud the name of the person you are introduced to. You can add "Nice to meet you" before or after their name. Everyone likes to hear their own name. Plus saying their name will show that you are paying attention, and it will help you to remember it. Job interviews require you to make a powerful, positive first impression. Do this by smiling, making eye contact, shaking hands and saying their name. Your first impression will be a lasting one. During Job Interviews Strategy #3: Use body language that shows you are enthusiastic, confident, and comfortable with the interview process. Job interviews can seem like intimidating situations, but as the old saying goes, "Never let 'em see you sweat." Walk into the room in a manner that exudes confidence and control. Not timid, but also not rushed. Just like you're walking up to greet a friend. Job interviews can involve a panel of people asking you questions. If there is more than one person asking questions, face that person and make eye contact when you answer them. But then extend your eye contact to everyone in the room if your answer is longer than a few seconds. You're speaking to all of them, not just the person who asked the question. During the Job Interview Strategy #4: Be yourself, but only up to a point. Let your personality show, but don't overdo it. Match your demeanor to that of the interviewers. For instance, if they joke around a bit to break the ice, go with it but don't laugh insincerely. Don't tell any jokes yourself. If you have a sense of humor and you've deduced that the interviewers do, too, you can use this in some of your answers (to a certain extent and when appropriate). You want to present yourself as a serious professional but also someone who easily gets along with others and is a pleasure to work with. You want to be likeable but never phony. Also, you want to exude confidence but never arrogance. During Job Interviews Strategy #5: Answer questions clearly and confidently. Because you've prepared in advance and anticipated many of the questions, your answers should be clear, concise and confident. Do not mumble or speak in a voice too quiet to be heard. You don't want the interviewer to ask you to speak up or repeat your answer. Do not ramble. Give enough detail to sufficiently answer the question and then stop talking. One of the great advantages of anticipating questions and practicing your answers in advance is that you can "edit" them before the actual interview. Many companies limit the interview time to 20 minutes or less. You want your answers to be short, focused and to the point. If you're not sure you've given enough information, simply ask, "Did I answer that sufficiently for you, or would you like more details?" During Job Interviews Strategy #6: After answering their questions, ask some yourself. Remember those questions you thought of during your PRE-INTERVIEW STRATEGIES phase? When the interview starts to wind down and they ask if you have any questions for them, be sure to speak up. In addition to the questions you thought of in advance, you might have a few based on how the interview went. If you want clarification about the job or the hiring process, ask now. Do not ask questions related to salary, vacation time, etc. Save those for after they offer you the job. Your last comment should be that you feel you would be a good asset for the company and you definitely want the job. Don't forget this! During Job Interviews Strategy #7: Exit gracefully. When it's clear that the interview is over, hand out copies of your letters of recommendation (if you haven't already done so) and any other portfolio items. 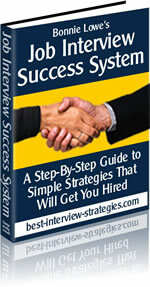 Shake hands again and thank your interviewers for their time and the opportunity to interview for the position. If you remember the names, say them as you thank them. Leave the room (don't forget your purse or brief case!) and breathe a big sigh of relief, knowing that you did an excellent job!